Observe Your Market: It is very essential to examine your market carefully. A good business person should observe all the market trends minutely before setting off his business plans in that particular market segment. The easiest and convenient way is to extract the details from the website of Ministry of Commerce of the country. Promote The Brand Value Of Your Company: In order to acquire the expected targets effectively, you must ensure to construct a brand value of your firm. This merely doesn't include the identity creation with logo and company's name, but a more comprehensive plan for a longer run. Only, quality of your products and a unique proposition can help your business retain in the longer run. Familiarize With The Local Customs: Down the years, facts have revealed that many successful entrepreneurs have established themselves by learning about the tradition and people of the markets where they had to sell. Knowing about the thoughts, ideas, values and customs can go a long way in client acquisition as well as relationship building. These were the basic necessities that can help your business flourish internationally. Apart from these, learning about the local laws and ethics along with employment of appropriate sales person can also turn out to be very prolific for your business ventures. These, along with a well planned strategy with set targets are the fundamental requirements for the globalization plans of businesses. 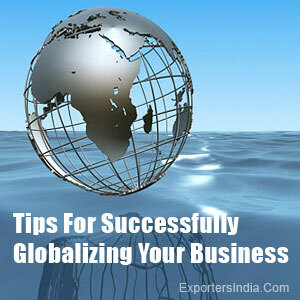 2 thoughts on "Tips For Successfully Globalizing Your Business"
The most important point is that "Observe Your Market" because when you continuously observe your market then it automatically teach you new strategies and you can easily analyze your business strategy. Therefore, in my opinion it is the most important thing to achieve your goals.